And yet, S&P’s statement (math error and all) was of a piece with mainstream budget projections from CBO and other official sources. These projections all assume steady growth, low inflation, and falling unemployment (in which case, one may ask, what’s the problem exactly?). Yet they also predict much higher interest rates. In these projections, it is mainly the vicious magic of compound interest—debt compounded on top of debt in computer models—that generates the explosive debt dynamic which rationalized the downgrade. These projections are so bizarre and so inconsistent that they survive only through the willful refusal of those who use them to actually look at them. With low inflation, why on earth would the Federal Reserve jack up interest rates? If it did, mortgages would go even more massively into default, stocks and bonds and real estate would again crash, so the growth rate could never be achieved. Not to mention the fact that actual economic growth rates have been below-track for two years, so that the short-term assumption that a sustainable recovery is underway is obviously and plainly wrong. None of this matters to the president, nor to majorities in Congress, nor to the pundit brigades. 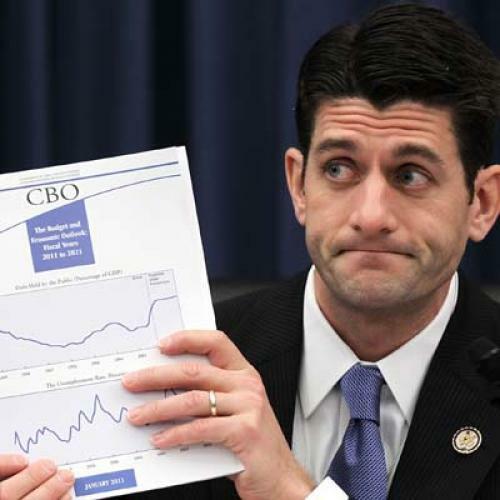 All have embraced the “long-term deficits” which appear in the projections as though they were foreordained history, sufficient to compel action now that will effectively cut Medicare, Medicaid, and Social Security, and curtail federal government investment, regulation, administration, and services to levels not seen since the 1950s. Exactly what that threat is remains elusive. Foggy rhetoric about “burdens” that will “fall on our children and grandchildren” sets the tone of discussion. The concept of “sustainability” is often invoked, rarely defined, never criticized; things are deemed unsustainable by political consensus, backed by a chorus of repetition from the IMF, headline-seeking academics, think-tankers, and, of course, the ratings agencies. On one side are those who profess to abhor all deficits, arguing that the productive private sector will rise up to offset all government cuts. This is an appealing 18th century viewpoint found in Adam Smith, a throwback to the days of peasants and petty craftsmen preyed upon by lords, kings, and tax collectors. The only problem is that things have changed since The Wealth of Nations was published in 1776. America does have a long-run fiscal problem, driven by the combination of rising health costs, an aging population, and the unwillingness to raise taxes to pay for the programs we already have. If we don’t come to grips with that problem, bad things will happen. Notice two things here: First, Krugman doesn’t say what the “bad things” are. Second, he does not mention the interest rate and never discusses what happens to the debt/GDP ratio if rates stay put. (Answer: It stabilizes eventually and nothing else happens, as I have shown in a paper linked here.) And thus he lends his great weight to the pressure that will build, later this year, for the cuts in Social Security, Medicare, and Medicaid that were deferred in August—and which Krugman surely opposes. The perverse character of the debt deal will now force the Pentagon into the fray on behalf of cutbacks in Social Security, Medicare, and Medicaid. This is true even though the Pentagon sequesters that would occur if Congress does not pass the recommendations of the new “supercommittee” are arguably phony. It seems obvious that both the Republicans and the White House understood this dynamic very well, which is why the defense-spending-cut rabbit came out of the debt-deal hat at the last minute. As usual, the progressives who momentarily thought this was a win for Democrats were duped. So what is to be done? This is not a moment to describe policies that would, for example, create jobs, build infrastructure, or deal with energy or climate change. Nothing like that can happen now until ideas change. And the first change must be to challenge and reject all the nonsense about long-term budget deficits, national bankruptcy or insolvency, and even “fiscal responsibility” that we are hearing. The entire object of this propaganda campaign is to cripple government—including regulation and the courts—and to roll back Social Security, Medicare, and Medicaid. The defense of those successful, effective—and yes, sustainable—programs just became far more difficult, and perhaps impossible. But it needs to be carried on to the last ditch. James K. Galbraith is author of The Predator State: How Conservatives Abandoned the Free Market and Why Liberals Should Too.